I was not planning on writing about the Martin-Zimmerman saga again. For one thing, I just wasn’t that into it. I had the normal amount of public interest in the story, and since it was a local one, it’s always interesting to watch your local area mischaracterized by the national press. But it wasn’t an obsession for me and I thought my previous post would be my last take on the subject. But post verdict, the issue refused to die. My twitter feed, my Facebook news feed, my web forums, and my television news are all filled with the results of the post verdict world, and it is not pretty. The MSM is insisting that this is racial issue, with Trayvon now elevated into the exalted ranks of civil rights martyrs such as Emmitt Till and James Chaney. The New York Times, which basically functions as the editor to every newspaper and TV newsroom in the country, has declared it a racial issue. So by the preponderance of noise, if not reason or evidence; it’s a racial issue. And what made George Zimmerman the 21st Century Bull Connor and George Wallace combined? and was part black himself. So George Zimmerman, who told family members he supported Obama for President because he wanted to end the Presidency as a club for white men, found himself declared a white man, and a racist one to boot, even being slandered by innuendo by the very President he supported. Of course, someone could have an item or two off of that check list and still be a racist, but all of them, with no actual proof otherwise? Considering that there are actual racial crimes that occur on a regular basis, what made the press champion this phony racial issue? I think it’s all due to Al Sharpton, the most powerful media influence in America. The fact that he is so powerful is fairly amazing. He hosts a low rated show on a low rated network, but was able to galvanize a nation into following his racial witch hunt all the way to Sanford, Florida. And why did Sharpton pick that case, when there is an abundance of real racial cases to choose from? That requires knowing a little something of Sharpton’s history, and as someone who has been a Sharpton follower since the Tawana Brawley debacle, Sharpton has created quite a reputation as a fraud and huckster, and an anti Semitic one as well. So I think, and let me emphasize that this is just speculation, that Sharpton’s interest was piqued when he heard the name Zimmerman. I think Sharpton intended to create Crown Heights all over again. Of course, even though Zimmerman turned out not to be Jewish, he apparently could still stand in for white, and he was presented as such, leading the New York Times to include the term “White Hispanic” in its style book; apparently with a picture of George Zimmerman by the phrase. So Sharpton, along with MSM, set up a fake racial issue, and have promulgated it fairly successfully for the past year, with really no effective counter narrative. They’ve managed to increase racial division in this country and seem to intend on continuing it as long as possible. For liberal whites, it serves as a vehicle to drive their agenda, which is increased gun control and elimination of legal protections for self defense. And what do Black people get out of this? Anger, hurt, and distrust of their fellow Americans. Not a great bargain in my opinion. And the biggest outrage of them all? The Justice Department is setting up an email address to receive tips to assist in the George Zimmerman investigation. Now, given that the criminal trial is already over, what “tips” could the Justice Department be seeking? Why, to charge Zimmerman with Federal Civil Rights violations. And to do that, they need evidence that Zimmerman is racist. So if Zimmerman used the N-word in Middle School, he could find himself indicted for felony charges. So the entire weight of the Federal government is going after one guy to see if he told a racist joke at any point in his life. If he did, it better be one about gringos. This entry was posted in Politica, Race and tagged Al Sharpton, Bull Connor, Crown Heights, Emmitt Till, George Wallace, George Zimmerman, James Chaney, news, Politics, race, race relations, Sherman Ware, Tawana Brawley, Trayvon Martin, White Hispanic. Bookmark the permalink. This is one of the best pieces I’ve read on the issue. I had not thought about the “Jewish name” issue in depth. Another thing the media misplayed was the “gated community” angle which made it seem like a class narrative, but it turned out to be, what looked to me anyway, like a crappy condo complex that was racially mixed. Yes it wasn’t exactly the Hamptons. It was a strictly middle class community. Sorry, I think I do use too many abbreviations. It stands for Main Stream Media. The utter hypocrisy of the MSM and their liberal thralls is demonstrated by their complete ignoration (I looked it up – it’s a word) of the Roderick Scott trial. Even though the two shootings were virtually identical other that the reversal of races of the shooters, most have never heard of the Scott trial while the Zimmerman trial was hyped to high heaven. Good point, William. But Scott’s claims to self defense were less solid than Zimmerman’s, as Scott’s assailant wasn’t straddling him and hadn’t even struck him yet. 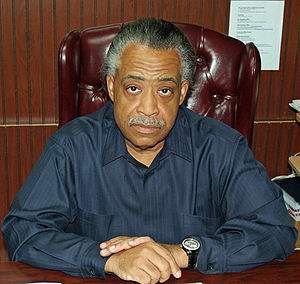 The real question is how does publicizing the Roderick Scott case benefit Al Sharpton? It doesn’t, so it’s a non story.